Even big fans of "The Cowboy Kid" are probably unaware that eight different kids played him on the air. I'd like to set out the data we know about these "Bobby Benson's" and see if it will encourage researchers to help us track down the missing three. In setting forth this info, I've credited some of the OTR researchers who have already helped me regarding some of these radio performers. #2) Billy Halop. In fall of 1933, CBS moved the production to New York City where radio actor Billy Halop was cast as "Bobby," and his sister, Florence, got the role of "Polly." He was the lead in over 600 shows, usually 5 times a week, until he got a role in the Broadway show "Dead End" and he left the radio cast to join stage rehearsals in fall of 1935. After about a year on Broadway, many of the cast were brought to Hollywood to film the "Dead End" movie. Halop made a lot of B movies, usually with the same gang of tough kids. When he died in November 1976 at the age of 56, he was living in relative obscurity. #4) Unknown NYC actor. Although Billy Halop left the radio series for Broadway, the radio show continued on CBS in New York until December 1936. So someone else was playing "Bobby Benson" for the last 15 months it was on CBS. Like the LA actor who had the role, his identity is still unknown. NOTE: Of the more than 700 CBS episodes aired, no audio copies have ever been found, although two scripts are available. #5) Ivan Cury. 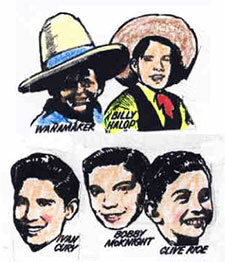 In June 1949 the series was resurrected on Mutual under the title of "Bobby Benson and the B-Bar-B Riders." Cury, who was born in June 1937, had plenty of radio experience when he won the lead. He played the role on both radio and a local TV show until his parents objected to all the unpaid personal appearance tours. He left the series, probably about the summer of 1951, and found better paying jobs, including the son on "Portia Faces Life." He stayed in the broadcast business in his adult life, doing TV production in LA and teaching communications in college. Ivan has attended both FOTR convention and the SPERDVAC one. #7) Clive Rice. A native of Surrey, England, Rice was born in January 1941. Under his professional name of "Clyde Campbell" he took over the role of The Cowboy Kid from McKnight, probably in the fall of 1951 and held the role until the radio version went off the air in June 1955. He was also on a local TV version. After HS, he had a long Navy career and is now retired in Roanoke, VA. He's attended OTR conventions in Newark and Cincinnati. About the author: Jack French is editor of Radio Recall, the journal of the Metropolitan Washington Old Time Radio Club, and a frequent contributor.